Working out of Fort Cobbs, OK, this broker helped match shippers up with trucking companies to get product delivered. Did you do business with them? If you’re trying to get paid on 5C Enterprises LLC debt, be sure to call . 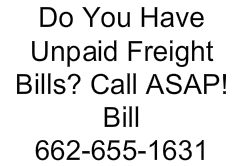 If you require help procuring the money you’re owed by Serapio’s Transportation LLC, call this number now. This company brokered deals between shippers and trucking companies.